The LG G3 Android phone has some impressive qualities -- but when you use it, you discover some interesting surprises. LG really wants you to want its phones. The Korean manufacturer has been working diligently to improve its devices with each passing year -- and it shows. This year's new flagship, the LG G3, is by far the company's best effort to date. For the first time, LG is moving beyond mere specs and finding meaningful ways to make its products stand out. But is this enough to make the G3 actually worth owning? The LG G3 stands out from its competition in several ways. I've been living with the U.S. model of the LG G3 for the past several days to search for that answer. (I also spent some time getting to know the international variant earlier this year.) The phone is available now for $200 with a two-year contract from AT&T, $200 with a two-year contract from Sprint, $598.80 with a two-year payment plan of $24.95 a month from T-Mobile or $100 with a two-year contract from Verizon. So what's the G3 like to use in the real world, and is it the right device for you? Time to find out. When you get the G3 in your hands, one thing's immediately clear: This isn't what you'd call a petite phone. The G3 measures in at 5.8 x 2.9 x 0.35 in., making it one of the biggest handsets you'll find in the non-plus-sized range (LG insists the device isn't a "phablet" like Samsung's Galaxy Note products). For perspective, the G3 is almost the same height as HTC's unusually tall One (M8) -- and a touch wider, too. Suffice it to say, the G3 is a bit of a giant compared to its contemporaries. What's interesting, though, is that even with its large frame, the G3 doesn't feel terribly bulky or awkward to hold. In fact, once you've had it for a few days, you don't even think about its size. With its thin profile and subtly curved back, LG's done a really nice job of making the phone comfortable in the hand despite its heft. That's even more remarkable when you consider that the phone has a 5.5-in. screen -- the same size panel used on 2012's Samsung Galaxy Note II, which was a significantly larger device. LG slimmed down the bezels on the front of the phone to eliminate extra space around the display, which allows you to get such a spacious screen without all the bulk that would usually accompany it. The screen is a noteworthy point, too -- though perhaps not quite as noteworthy as LG would like you to believe. 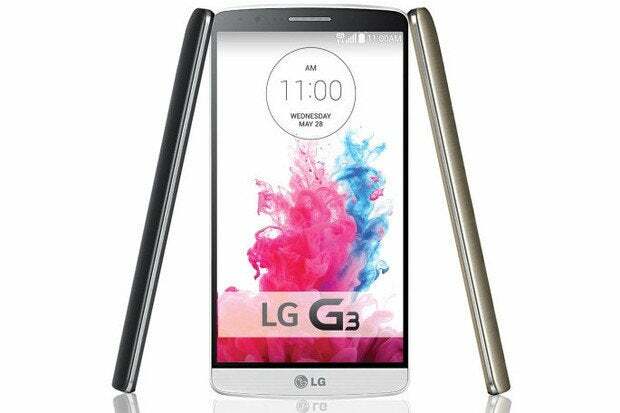 The G3's display utilizes an extraordinarily high resolution known as Quad HD. For the number nerds among us, it's 2560 x 1440 with a whopping 538 pixels per inch. For comparison, a typical 1080p screen -- like the one on HTC's One (M8) -- is 1920 x 1080 and 441 pixels per inch. Unless you have superhuman vision, however, you probably aren't going to notice the difference. Plain and simple, we're reaching the point where screens of this size have more pixels packed into them than the human eye can detect. I did a real-world comparison with the G3 and the One (M8), and the differences in sharpness and detail between the two were virtually imperceptible. That's not to say the G3's screen doesn't look fantastic -- because it does. It's bright and crystal clear, with image quality sure to satisfy even the most discerning eyes. And it's easy to view outdoors, too, even in direct sunlight. I find I actually prefer the contrast and color saturation on the M8, but that's getting nitpicky; the G3's display is absolutely gorgeous and among the best on the market today.